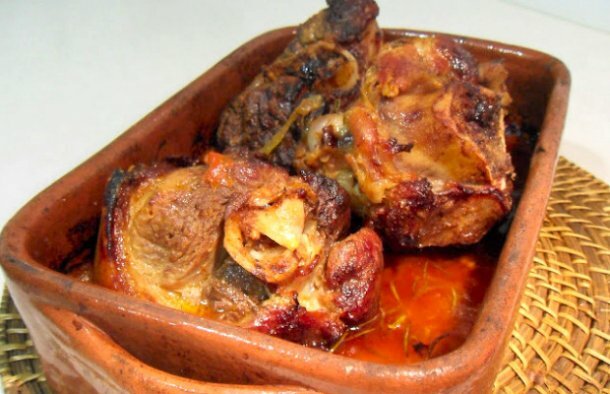 This Portuguese roasted pork shank recipe (pernil de porco assado) is simple to make and very delicious. Preheat the oven to 205ºC or 400ºF. In a clay casserole dish, put the pepper paste, chopped garlic, olive oil and mix. Add the chopped onion, the chopped red pepper and the sprigs of rosemary (to taste). Finally, place the pieces of shank, drizzle with the white wine and a strand of olive oil. Season both sides of the pieces of shank with salt. Bake for about 2 hours, turning sides every half hour. 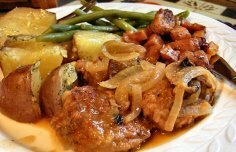 Serve this Portuguese pork tenderloin with some Portuguese roasted potatoes and cooked vegetables. 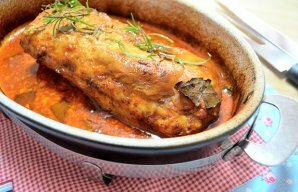 This Portuguese pork tenderloin with rosemary and paprika (lombo de porco com alecrim e colorau) makes a delicious dinner, serve with sautéed vegetables and white rice.